Iaorana korua! Welcome to EISP’s dispatches, jottings, and journal entries, sent to you by our 2007 field team on Rapa Nui. Our records and reminders are of work done, people encountered, questions posed, and ideas explored. We are happy to share with you our adventures on Rapa Nui! We departed LAX at 1 p.m. November 2. Twenty-one plus hours and two stops later we landed on Rapa Nui under a brilliant blue colored sky sprinkled with fat puffy white clouds. 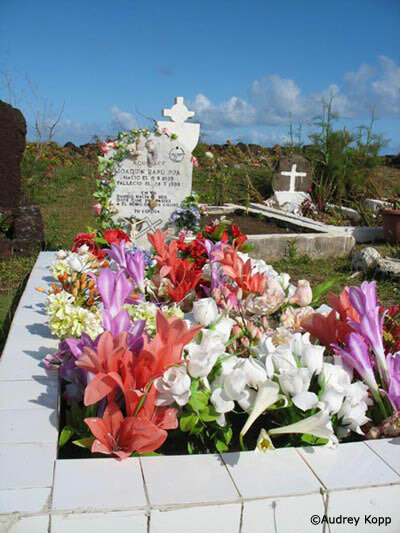 The land which greeted us displayed brilliantly colored tropical plants: the familiar bougainvillea , fiery-flowered coral trees unlike the naked branches we now see at home, startling white lilies and a white-petaled daisy-like flower. Sunday we worked setting up the office at the site of the about-to-be-finished Mana Gallery which will serve as a showplace for the work of local artists. Then Alice took Jaine and me on a tour of downtown Hanga Roa, our new hometown. Monday morning we continued our walking tour as we visited the local cemetery, replete with flowers, both plastic and homegrown. 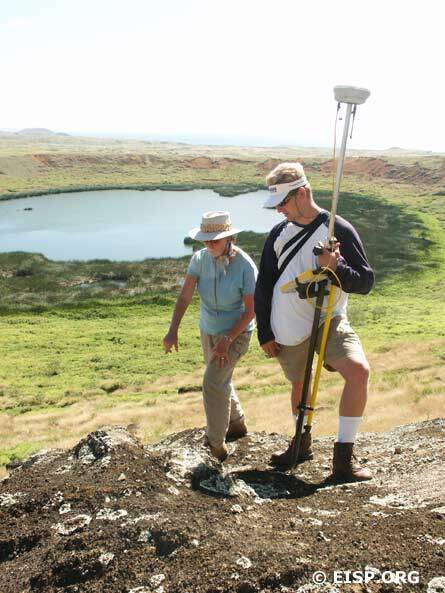 Jo Anne Van Tilburg and Matthew Bates discuss which points to take during the Rano Raraku Interior Quarry survey. Iaorana korua! Welcome to EISP’s dispatches, jottings, and journal entries, sent to you by our 2004 field team on Rapa Nui. Our records and reminders are of work done, people encountered, questions posed, and ideas explored. We are happy to share with you our adventures on Rapa Nui! 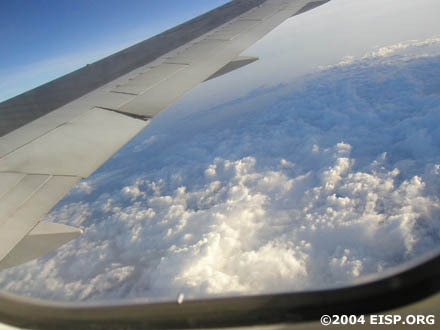 12 July 2004: Preparing for Departure! Hello! It’s the day before the big trip. I’ve been gathering up the necessary field materials and will leave the Archive at UCLA soon (I hope). We’ll be updating this page with new photos as soon as we get situated on Rapa Nui. Glad to have you along for the ride! I’m happy to have all my team back on the island! It’s very exciting to think we will be able to finish the final mapping of the interior quarry. It has been very nice weather in this season (winter) and I miss Bill’s good coffee! View from the flight to Rapa Nui, somewhere over the Pacific. © EISP 2004. 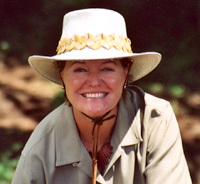 As we wing our way toward Rapa Nui, I am thinking of the work ahead. This is our final mapping season in Rano Raraku interior quarry!! We began our first and second field seasons with Peter Boniface of Cal Poly Pomona on our team, and on this trip one of his students, Matthew Bates, is carrying on that work, joining our team as surveyor. He will complete an important and challenging series of mapping tasks in both Sections C and D, and the statue survey points he collects will be augmented, as in past seasons, by digital and metric data. EISP, the Rapa Nui Community, and Island Agencies Cooperate to Preserve the Archaeological Record. 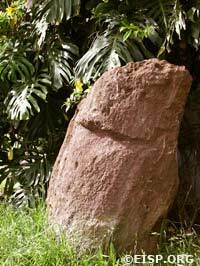 Front view of red scoria moai standing in Nely Pakarati Manutomatoma’s garden. Photo by Alice Hom. © 2002 EISP. 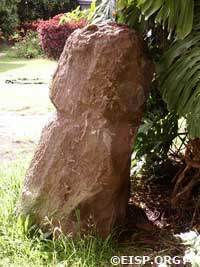 Left view of red scoria moai standing in Nely Pakarati Manutomatoma’s garden. Photo by Alice Hom. © 2002 EISP. Iaorana korua! Welcome to EISP’s dispatches, jottings, and journal entries, sent to you by our 2003 field team on Rapa Nui. Notes, footnotes, and field notes…our records and reminders of work done, people encountered, questions posed, and ideas explored. We are happy to share with you our adventures on Rapa Nui. Always eager to depart for Rapa Nui, I am always reluctant to leave home and family. This is, by my imprecise count, at least the twentieth journey I have made to the island since my first in 1981. Even though I’m only one of many “northern shadows flitting across a southern landscape,” I still fancy myself an explorer. I love the adventure of each new field season and its promise of discovery! Bill White, Alana Perlin and I are the first to depart LAX, and Peter Boniface will follow. 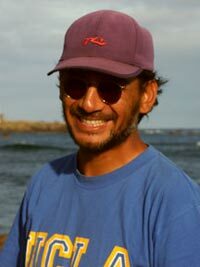 EISP co-investigator Cristián Arévalo Pakarati will, as always, join us on our arrival on Rapa Nui. So, too, will Susana Nahoe Arellano, a new member of our team. 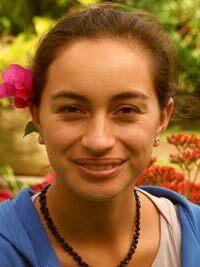 Susana is a Licenciada in Anthropology (Universidad de Chile) with experience in Rapa Nui archaeology.